Cryptocurrencies could gain wider appeal over time, but we see them as far from earning a place in mainstream investment portfolios for now. The Federal Reserve expressed greater confidence in both its growth forecast and inflation outlook, sending U.S. government bond yields up. Germany’s Social Democrats are expected to approve a coalition government, despite rising chances of a no vote. Italy goes to the polls. Cryptocurrencies are piquing investors’ interest around the world. Their market capitalization has reached nearly $500 billion after dramatic price increases in 2017, but we don’t see them becoming part of mainstream investment portfolios soon. Crypto markets are highly volatile, fragmented, largely unregulated, and come with unique liquidity and operational risks. Cryptocurrencies are wildly volatile. 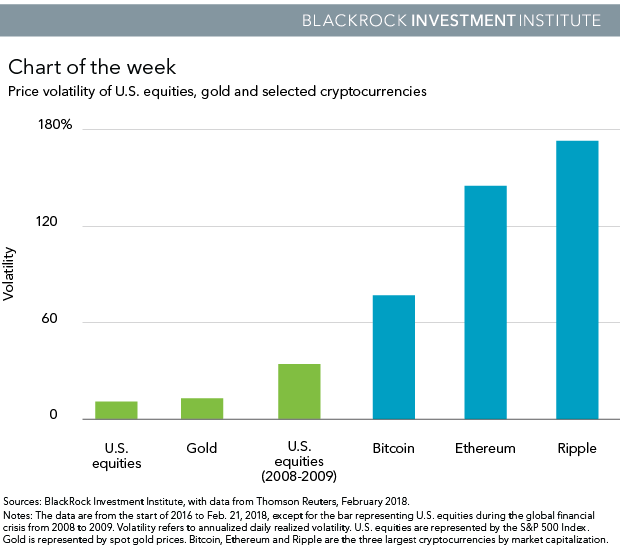 We compare the annualized daily price volatility of the three biggest cryptocurrencies by market capitalization — Bitcoin, Ethereum and Ripple — with U.S. equities and gold in the chart above. The volatility of the cryptocurrencies makes the gyrations in the U.S. equity market during the global financial crisis almost look placid. There are over 1,500 cryptocurrencies. Spot trading of these “coins” takes place on more than 400 online exchanges around the world — with no central order book. The nature of cryptocurrencies makes them tricky investment targets. On top of dramatic price swings, cryptocurrencies face major challenges such as weak regulation and security flaws at cryptocurrency exchanges and other end points. Valuation is difficult, as cryptoassets have no cash flow, earnings or interest rate. Their uses vary from a speculative bet to payment medium. The market is evolving, however. Established exchanges have launched cash-settled Bitcoin futures, but so far the reception has been lukewarm. High margin requirements are one reason why. A global regulatory framework may be in the offing — how to regulate cryptocurrencies is on the agenda of a G20 meeting in March. Cautious on Bitcoin and bullish on the underlying blockchain technology — this is an emerging consensus among policymakers and business leaders. Blockchain, a distributed ledger technology, enables secure peer-to-peer transactions. This means no intermediaries, but also no trusted centralized authority. Companies in a wide range of industries, from logistics and pharmaceuticals to financial service, are looking into its disruptive potential. Yet challenges abound. Take the financial industry. A blockchain-based, single shared financial database could eliminate inefficiencies and risks associated with human processes, but adoption at scale would require a massive shift in software development and a well-constructed maintenance model. Regulators and central bankers would also need to play a big role, we believe. Our bottom line: We see cryptocurrencies potentially becoming more widely used in the future as the markets mature. Yet for now we believe they should only be considered by those who can stomach potentially complete losses. Similarly, blockchain needs to overcome significant hurdles to reach its promising future. This material is prepared by BlackRock and is not intended to be relied upon as a forecast, research or investment advice, and is not a recommendation, offer or solicitation to buy or sell any securities or to adopt any investment strategy. The opinions expressed are as of Feb. 26, 2018, and may change as subsequent conditions vary. The information and opinions contained in this material are derived from proprietary and nonproprietary sources deemed by BlackRock to be reliable, are not necessarily all inclusive and are not guaranteed as to accuracy. As such, no warranty of accuracy or reliability is given and no responsibility arising in any other way for errors and omissions (including responsibility to any person by reason of negligence) is accepted by BlackRock, its officers, employees or agents. This material may contain ‘forward looking’ information that is not purely historical in nature. Such information may include, among other things, projections and forecasts. There is no guarantee that any forecasts made will come to pass. Reliance upon information in this material is at the sole discretion of the reader.